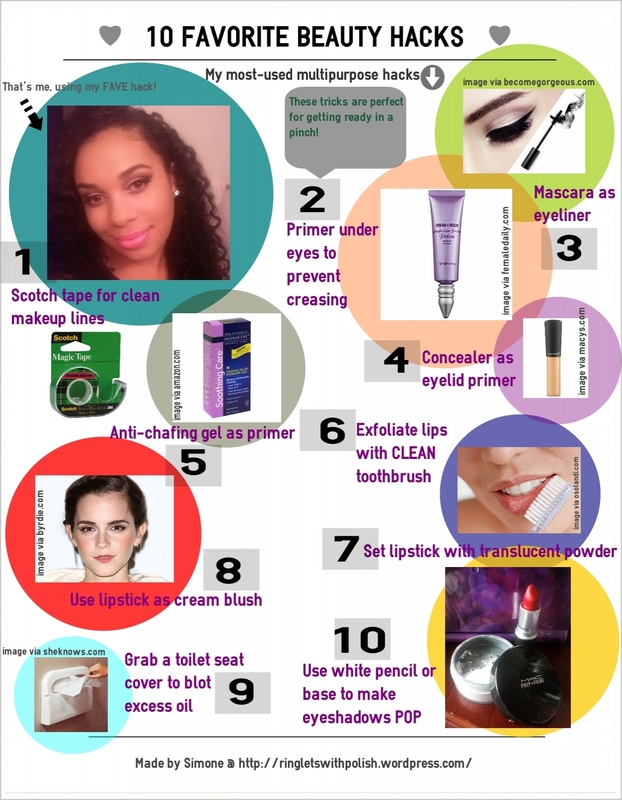 I thought I would bring you a list of my favorite beauty hacks! These are tricks that I use when I am pressed for time, or I forget certain products at home. I made this visual list of tips to help illustrate my points! Make sure to read below the infographic for further explanation of the tips! Ok let’s break this down. 1) Scotch tape for creating a clean makeup look. I use this method to get that nice and crisp line for my eyeliner and eye shadow. Follow the shape of your lower lids to create the perfect dramatic line. This is my go-to trick for a night out with my friends. 2) Eyelid primer under concealer helps eliminate creasing under the eyes. Also, make sure that area is fully moisturized, this will also prevent creasing. 3) Use mascara as eyeliner when you have misplaced your regular gel liner. Simply dip an angled liner brush into your mascara tube and apply like you normally would with gel liner. 4) Use concealer as eyelid primer when you run out of your favorite pricey eyelid primer (mine is Primer Potion!) or you feel to lazy to pull your primer out of the drawer. 5) Use anti-chafe gel as face primer in the event that you do not pack your beloved Porefessional primer in your suitcase, but have somehow remembered anti-chafe gel haha. Priorities people, priorities. 6) Use a clean toothbrush to exfoliate lips when you feel your lips resemble the Mohjave desert. I am an exfoliating junkie. I use a nice clean toothbrush (not the one I use on my teeth, you weirdos) and scrub off the dead skin with vaseline. 7) Set lipstick with translucent powder to give your lipstick extra staying powder. Tap it on top of your lipstick and blot blot blot! This step can also be used to transform any lipstick to a matte formula. 8) Use lipstick as a cream blush when you leave the house looking like Casper’s long lost cousin. Give cheeks a little pop by dotting them with your favorite coral or pink lippy. 9) Grab a toilet seat cover and blot your face to avoid looking like an oil slick. I have especially oily skin, so I try to keep oil blotters on me at all times. In the times that I forget my trusty little blotters, I utilize the crap out of those toilet seat covers. Did you see what I just did there? Haha, pun intended. 10) Use a white pencil or base to make eyeshadows really pop out. This especially important if you have a deeper skin tone. It makes a world of a difference to apply a white base before you apply that hot pink shadow. Just do it, trust me. I hope these helped you all out. Let me know about your favorite beauty hack! I’d love to learn some new ones! 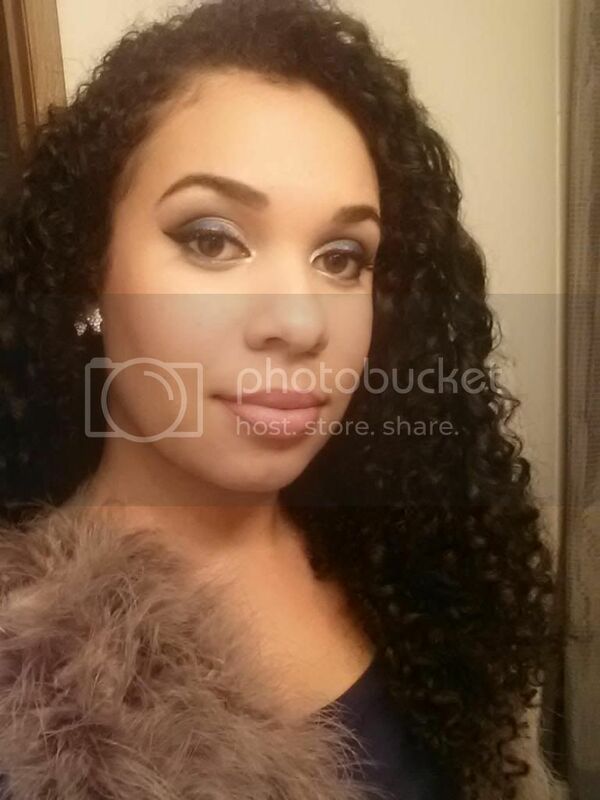 This entry was posted in Makeup, Tips and Tricks and tagged beauty, beauty hacks, concealer, eyeliner, eyeshadow, favorites, hacks, makeup, primer, products on April 27, 2014 by Simone.